Say hello to my most reader-loved recipe! 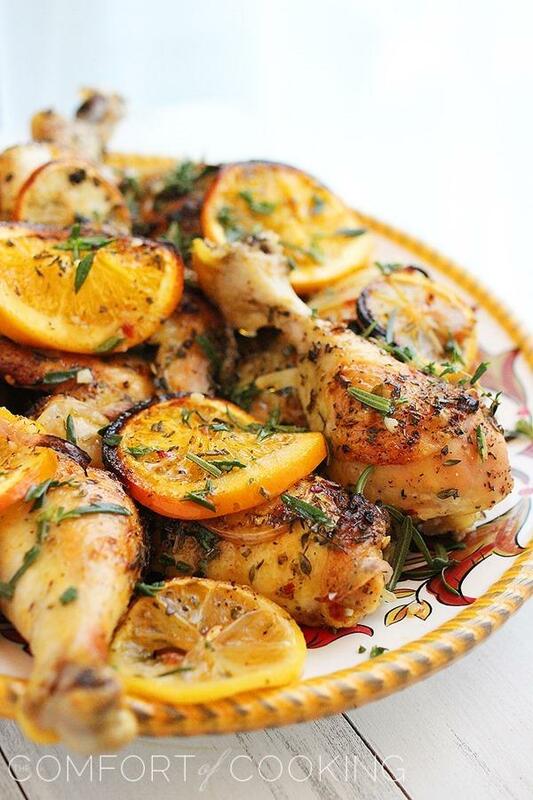 Try this easy, elegant roasted chicken with fresh lemons, oranges and herbs. It’s perfect for weeknight meals or special occasions! Not to mention – making this meal probably cost me a whole $8. It was totally scrumptious and so easy, too. Whip it up for a weeknight meal or a casual dinner party that calls for something elegant yet simple! I’m the same way about going out to eat, and this roasted chicken looks def. restaurant worthy! Gorgeous and oh so tasty! Oh my goodness, Georgia, this is STUNNING. I have to eat that ASAP! This is beautiful! Wow! Like Stephanie said I need to make this ASAP! If I had an orange I’d be making this right now! Gorgeous photos and love the before and after. Hands down, the prettiest chicken recipe I’ve ever seen. Georgia, your photography is always STUNNING. It’s hard to make chicken look incredibly tasty and you did such a fine job! Saving this recipe! Isn’t it amazing how delicious and satisfying roasted chicken is! And as you pointed out – it’s so cost effective! Yours looks like it turned out just perfectly and I love the orangey marinade that goes along with it. I’ll be trying this both roasted and grilled! This recipe is so timely for me – I just got a bunch of different fresh herbs from a friend and I am trying to figure out how to use them all. Beautiful! That is a keeper! Looks so appetizing and it sounds very easy. Merci. This chicken sounds totally wonderful – so full of flavour! I just realised that I hadn’t updated feedly when you launched your new site so I’ve been missing out on all your posts. So glad to catch up! This is my kind of meal! Your pictures make this meal look incredible! This chicken looks incredible! I had a hard time choosing a favorite picture to pin – all your photos are mouth-watering! Roasted chicken is some a homey meal. The lemon really brightens it up. I need to make this! This chicken is making my mouth water! It looks so moist and packed with lemony flavor! 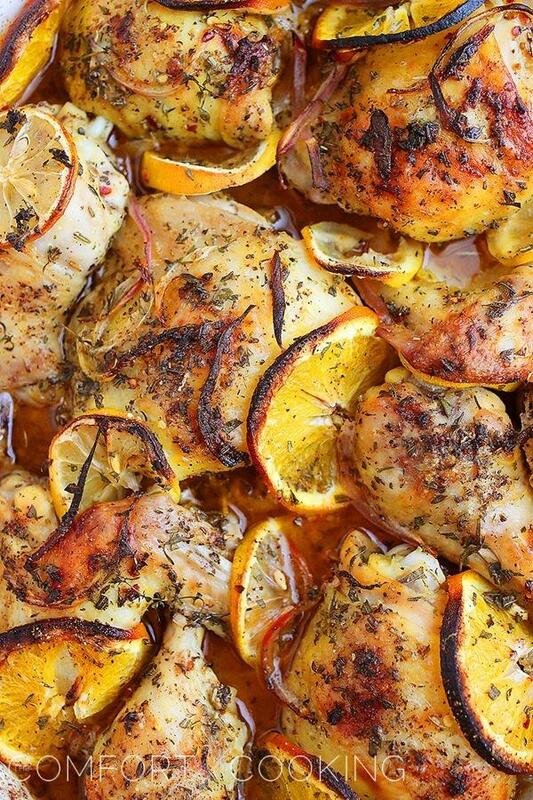 I’ve roasted chicken with lemon, but I’m loving your addition of orange. Lovely, lovely! that’s really one of the problems with cooking so well…recipients of your food never see any reason to go elsewhere to eat! Even though I do love going out for a nice meal every once in a while. this meal is definitely gorgeous and looks way better than most restaurant chicken dishes that I’ve seen! My husband said the same thing (and I thought that was a nice compliment..hehe). Oh but in your home, I totally agree with your husband: you make everything so good, def no need to eat out. ;) This roasted chicken will be on our dinner menu! I was thinking a lot regarding this topic about herb and citrus oven roasted chicken, so thanks for bringing it up here. You certainly have a good writing style i like, so will be subscribing to your blog. Wishing this was my dinner tonight. LOVE the before after photo!! 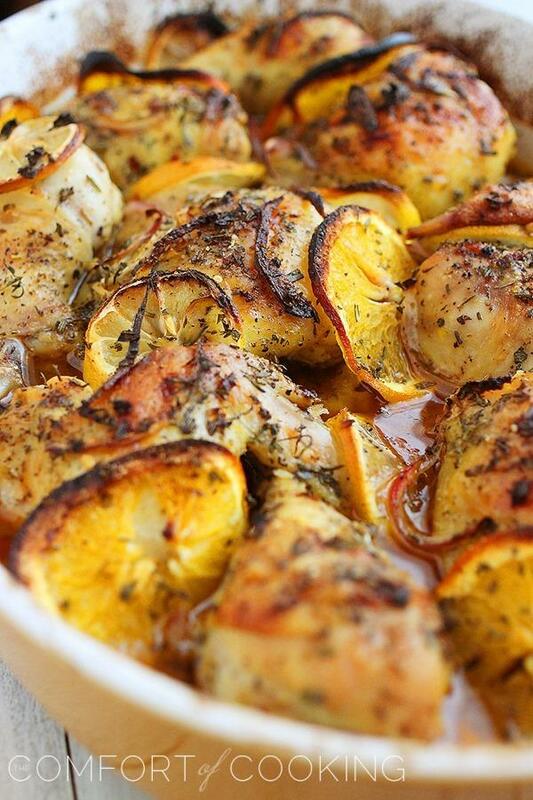 Georgia, what a beautiful chicken dish…love the flavors…herbs and citrus…delicious! Goodness this looks delicious.. Beautiful photos. Ooh, this sounds SO good, Georgia! I love the idea of serving it at a dinner party – it’s elegant yet simple at the same time, + would easily serve a group. YUM! This looks so beautiful and delicious. I love citrus with chicken like this! It might’ve been the long, cold winter or just gaining more confidence in the kitchen but I find myself cooking more and more and whereas we used to eat out most of the weekend, we are eating at home a lot more. A little conflicted since I do love to eat out but it’s so nice to prepare homecook meals that are healthier for my family! I did a roast chicken on Sunday and my son said it was like Thanksgiving : ) …this dish would make a great family dinner. I wish I had everything to make this for dinner right now, it looks amazing!! This looks delicious! Roasted lemons are the best! Especially with chicken! Thanks for sharing! Georgia, just gorgeous! This is my kind of family chicken dinner! 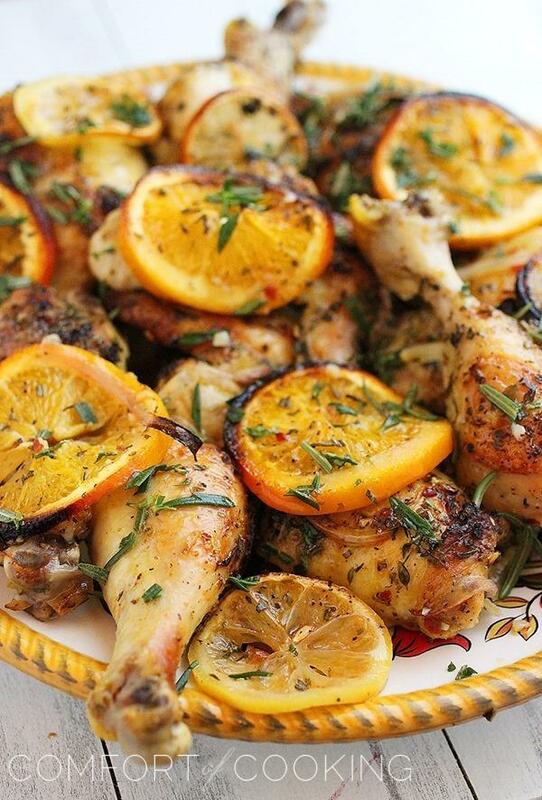 Love citrus, herbs and poultry together—my absolute favorite. In fact, it is just not Thanksgiving unless I do my Tangerine-Glazed Roasted Turkey. The aroma as it roasts makes the house so fragrant and out-of-this-world inviting! I will be making your recipe soon…very soon! The Big Lug will love it, too. Pinning… :) xo P.S. By the way, stunning photography. I really dig the fabulous side-by-side feature of the before & after. So creative! 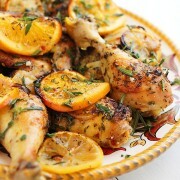 Love the sweet orange with the savory flavorings in your beautiful roast chicken. I don’t blame your husband for wanting to eat – he’s one lucky guy! Love this, all the colours are so vibrant and I love oven roasted chicken. Doesn’t look too hard to make either, I hope I can make this soon! This looks just gorgeous, Georgia! It looks so flavorful and I love that it is not too difficult to make! This chicken looks absolutely perfect! oh my this looks delicious. 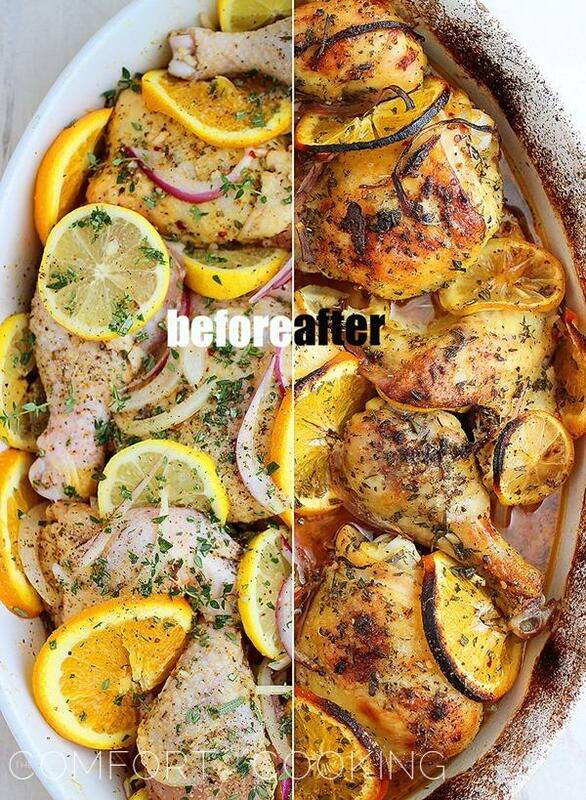 I love the before and after photo.. look at how gorgeous the chicken looks after. the fact that you used both lemons and oranges remind me of turkey stuffing, I think Italian people do that when they stuff their turkey. Great idea and love THYME! This chicken is mouthwatering and your photos are simply gorgeous! We would love to have you link it up with our Wednesday link party! Heavens, this looks so good! I have been loving everything lemon and this would hit the spot. Beautifully photographed chicken that sounds delicious. What a gorgeous meal! Those photos are stunning. Beautiful! The chicken looks amazing. Love this!… I love the before and after picture. How did you do that! Georgia, this chicken recipe is stunning and one I must make soon for my family! I can smell the citrus coming through my computer! Great composition to! This is EXACTLY the recipe I was looking for this morning. Got chickens and a bunch of people coming to dinner tonight. All I wanted was a simple baked chicken recipe and I consulted a dozen cookbooks and epicurious without success. Went to tastespotting and there it was! Looks wonderful and so easy. So happy. Thanks!!! Your herb and citrus roast chicken is my kind of dinner and yes-it’s not easy to order roast chicken this good in a restaurant! I am so going to make this for my boyfriend sometime! Made this for the Family tonight, turned out great. Huge compliments for the subtlety of flavor. I didn’t modify the recipe at all. Thanks for the great dish. This chicken was DELICIOUS! I made it tonight… it has a sweet & savory mix of flavors… melt in your mouth! Does the cooking time/temperature change is I use bonless chicken instead of bone in chicken? Yes. If you’re baking boneless chicken breasts, only about 30-40 minutes is needed. We are all chicken lovers at home so we usually enjoy any recipe with chicken. And this absolutely a nice one to try on, though I’d like to try on potatoes with some herbs. This may be a silly question…Im about to put it in the oven right now, do you cover it with foil or leave uncovered. Cant wait to taste this!!!! As the recipe states, bake uncovered. If you marinade overnight, do you dump the whole thing in the pan or drain the marinade. Can’t wait to try this. Add it to the pan with the marinade, do not drain. I made this for dinner tonight and it was SO delicous. My whole family devoured it!!! I served it with rice, which was perfect for soaking up the sauce. I’m getting hungry again just thinking about it!! Made this tonight with the lime and cilantro substitute (two things that are ALWAYS on hand in our household). Tasty and soooo easy. While it was in the oven, I made a lemon and asparagus orzo. My turns cooking dinner generally involve some sort of minor (or major) cooking disaster, but this recipe went off without a hitch. Thank you so much! This looks amazing! Cant wait to try it. I have a couple questions, I plan on making this with boneless chicken breast, is there a time/temp adjustment I need to make? And second, if I marinate this overnight do I need to dump out marinade before baking or can I still bake it marinade and all? Hi Danyka – I addressed these questions in the comments already, but will again. Just 30-40 minutes is all that’s needed for chicken breasts. And yes, you add the chicken with all of the marinade to the pan. I made the recipe and left out the oranges. I also doubled the garlic and italian seasoning. It was to die for. Thanks for the recipe and pics. This was one of THE best chicken recipes i have ever made. i don’t usually comment on food blogs (maybe i should more often), but i HAD to leave a comment since it was so, so delicious. thanks for an amazing recipe! I want to leave out the sugar and will it still taste as good? Yes, definitely! The sliced fruit might not get as caramelized, but it should still taste great. The sugar just helps balance the citrus acidity. Hello Georgia, I made the recipe last night for dinner and it had a pretty good flavor but not as strong as I would have like it. I think what happened is the natural juices from the chicken cooked out and diluted the marinade, thus my chicken was sitting in a water/ marinade mixture. I also cooked my chicken on 375 because I didn’t want it to dry out. Do you have any tips on how not lose flavor during the cooking process? I used a whole chicken cut up. I’m sorry that happened to you, Stephanie. This has never happened to me, so I can’t say exactly what went wrong, but if you pat the chicken dry before marinating it shouldn’t end up cooking in its own juices. Your lower cooking temp probably also played a part. Trust me, it doesn’t dry out at 400 degrees! I hope you give it another try. Repeating what everyone else wrote….. Best Chicken I’ve Ever Made!!!!!! I added carrots, green beans, and cherry tomatoes. Thank you so much for sharing!!!! Is the Italian Seasoning the one used to make dressing (Wishbone) or the one in the shaker? It is a dry spice – you can find it in the spice aisle of most grocery stores. Woke up early to get this marinating for tonight’s dinner. Excited about it after reading all the reviews. Thanks for sharing the recipe and the great pic. I made this last night and allowed it to marinate throughout the day (~8 hours) and it was absolutely delicious! I love the combination of the flavors and it will be a part of my recipe book! I only had thighs and made about 2 lbs and my husband and I ate every last bit. I am typically not a fan of bone-in chicken but this was still awesome! Question (I’m a TOTAL novice in the kitchen, no idea what I’m doing): mix it in a baking dish but cook it in a different pan? Thank you! It all goes in one pan. I can see how you would have thought that, so I changed up the wording a little. Hope you enjoy! Just wondering if the chicken can be skinless for this recipe? I’ve never tried it, but that could work. If your chicken is boneless, just decrease the cooking time to 30-40 minutes. Trying this tonight! So exicted – it looks fantastic. Thanks for the recipe and the gorgeous photos! The photos definately made me want to make this as soon as I saw it. :) Keep up the good work. I’m trying this out as I type this but the chicken doesn’t seem to be browning in the oven and definitely not as golden crispy like your photo. What could I be doing wrong? You didn’t give any details so I’m not sure, but if you’re following the recipe exactly it should come out as pictured. This has become my “go to” when having people over for dinner lately. It’s really easy, but looks really elegant on a platter in the center of the table. AND it’s delicious – everyone always asks for the recipe. I also love that it doesn’t break the bank when adding a few more people around the table. Thanks for making me look good! This was so delicious!! Made it tonight and it was a great hit with everyone! We used drumsticks. Thank you so much for this recipe! I have made two huge batches of this so far for two church functions and everyone loved it! I needed to make something that was gluten free and dairy free, and this was great! Rave reviews all around. 5 stars. 2 thumbs up! I want to take this to my church finger food pot luck but there are about 25 people coming. I was thinking of maybe scaling it down to drumlets and little wings, think it would still work? just cut down the time? That should work fine. I’d say 30-45 minutes is all that’s needed. Just spread them out (no overlapping) so they can get crisp and bake evenly. Enjoy! How long do you think you would cook bone in chicken breast? Thinking about trying this recipe out….and if we like it will be making it for my son’s birthday party, so I wanted to have a combination of white/dark meat. Cooking for 40-50 minutes would most likely be best. I made this last night for dinner exactly as the recipe listed and my BF and I just loved it! I do have one question though, my chicken skin didn’t get that golden color like yours, nor was it crispy. I cooked for an hour at 400 and then popped it back in for about 5 min longer but didn’t want to dry it out. Any advice to get that golden crispy skin like in your photo? I’m so glad you enjoyed it, Faith! As far as the crispy skin, you can try positioning your oven rack higher in your oven next time. Mine is always a little higher than middle position, but other than that, no special tricks here! Thanks for your comment. AMAZING! I made this tonight with garlic rice and large salad. My guests and I ate all of it. The juices were great on top of the rice as well. I also substituted fresh cilantro for the rosemary and thyme. Have this marinating right now and can’t wait to try! I would like to add carrots to the pan while cooking. Good idea! At what point should I add the carrots? I’d toss them in after the chicken has been roasting for 15 minutes (or with 45 minutes remaining). can you subsitute lemons for limes? Yes, you can substitute any citrus fruit. As a newylwed…I am looking for new recipes to make and this was #!! SO EASY! It really was the best meal we have had since the wedding! Thank you…not only for the recipe for for making me not afraid of bone-in chicken and my roasting pan! Do you think I can add potatoes into this to have an easy side as well? How would that turn out? Yea sure! I’d add halved fingerling potatoes or small whole potatoes. They should take the whole hour, maybe a little less. Just made this tonight and it was delicious. I marinated the chicken breast overnight and served it with citrus rice. Well definitely make it again! same marinade and pour it over the chicken when I’m ready to cook it? What a beautiful chicken dish. Citrus and chicken is just a classic combination, isn’t it? I made this the other night and based on your suggestion added halved fingerling potatoes. Holy amazingness!!! I didn’t have the crispy skin like yours and I did put it above the halfway rack. Anyway I broiled it for 5 minutes after it was cooked and I got the crispy skin. Amazing flavors! Thanks so much for this recipe. It will be added to my weekly menu! Absolutely delish! Husband loved it! And so easy to put together! This is definitely going into the regular menu rotation. Found this on Pinterest. It looks amazing! I will be making it tonight. I have to tell you, as a kitchen addict I have NEVER followed a blog that I have found through Pinterest….. You will be my first! Thanks for posting! This is in my oven baking right now!! It smells sooo good! I don’t cook … like…ever and this recipe was very easy to make! I hope it turns out good i’m really nervous! I don’t cook either!!!! But I had to try this dish… I can’t wait for it to be done… Hopefully the chef in my house enjoys it :) I’m so nervous…. Hi! I am making this tonight for my husband and me and I just realized I have a bunch of pine nuts I need to use soon– do you think that would be good added to this dish? Beautiful pictures by the way!! I made this tonight and it was amazing! Even my 3 year old ate it happily. I had some leftover fresh sage in the fridge that I added to the herbs on top and I put the excess liquid from the pan through a fat separator and served it at the table for pouring over the top (and soaking up with bread). This is my new go-to chicken recipe. I can’t wait to experiment with different spice/herb combinations. Thanks!! My boyfriend and I made this for dinner one night but instead of chicken pieces we used chicken breasts. It came out sooo good and looked just like the picture! We’re making it again tonight! Thanks for the great recipe! Made this today. Yummy and pretty presentation as well. My house smells good too! Thank you! I made this for dinner tonight & just went back for yet another piece at almost 11pm! This dish is fabulous! I cook chicken dishes with lemon & herbs all the time but it’s the orange that really makes this a winner! It just takes it up to a whole new level of awesomeness! Found my way here through Pinterest but will definitely be sticking around!! If I don’t have Italian Seasoning can you suggest anything else to use? Or is is a must for me to run out and get that? Thanks for your help! This recipe looks amazing. You can use a mixture of dried basil, thyme, rosemary and garlic powder instead. Herb de Provence also works well, too! This recipe is delish!! I made this 10/4/13 and used a whole chicken, since it was what I had on hand and thawed. I didn’t have time to marinade but still had plenty of flavor throughout whole chicken. I used a vertical roaster and cooked at 425 for 1 hour and it came out perfect! My recommendation would be to not use as much juice if using as a rub but definitely put slices of lemon and orange under skin and inside cavity so you still get the tangy/sweet flavors. Thanks for the cooking inspiration! Delish halved ingredients placed into two ziplock bags with half chicken in each bag and froze for quick and easy meals. A keeper and ideal for two. Just wondering if you know the caloric content or nutritional value of this dish. I am trying to find recipes to make for my dad- he is on weight watchers. You’ve made my night, Georgia! I’m drooling looking at this post. I’ve been on a roasted chicken roll lately and this one looks so delicious! I love the combination of citrus, herbs, and garlic. Definitely keeping this on my “to do” list. Great post and fantastic photos! i found this on Pintrest and i happen to have everything to make it. everything but the pan to roast it in so i’m using my dutch oven cross your fingers it comes out the same. if i can i will try to send you a picture of the results! have other recipes. How do I find them? The recipe states to cook the chicken skin side up. One of the best chicken dishes I have ever made! Thank you so much for the recipe! Havent read all the posts, skimmed through some.. I really want to make this chicken but I am not a fan of thyme and rosemary. You can swap the herbs for anything you prefer, or leave them out if you wish. What about reheating it? What temp and for how long? Depending on whether you’re reheating it from frozen or refrigerated, times and temps vary. If frozen, thaw in the refrigerator first. If refrigerated, 350 degrees for 30-45 minutes should do it, but just cook until warmed through. I love this! I made it tonight and loved it. I had to cook about 15 minutes longer but it was worth it. Definitely a keeper! Depends on the size, but a typical orange yields about 1/4 cup juice. Best chicken ever! Making it for the second time today for my husband. Thanks for sharing this! Best wishes to you and yours! Terrific recipe! Besides tasting and looking fantastic, this recipe is so adaptable. Different amounts and cuts of chicken and different spices and citrus. I tucked some bread chunks among the thighs then covered them with the citrus slices and they came out tender and juicy. I’d like to try it with pork. This recipe is a keeper. made the chicken for my boyfriend and my parents and they LOVE it. Georgia you are now officially bookmarked in favorites and my go-to whenever I need a great idea. I made this last night, no substitutions and it was fabulous! Served with baked yams and every bite was divine. This chicken was fantastic! I made this using legs and thighs, and I could not have been happier with the end result. The chicken was juicy and flavorful. I was a little concerned beforehand that the citrus might be a little too strong, but my worry was unfounded. The other elements balanced out the citrus wonderfully. Great recipe! This is great! I was wondering if you could make it in the crock pot? Have you ever done it like this? Also, I was wondering if you have to leave the skin on? I wondered if it would still brown or if it would dry out. Sorry if you already answered these questions, I didn’t see them if you did. I found this delicious recipe on Pinterest and it has been my go-to recipe for an easy, yummy meal. I initially served it with whipped cauliflower but last night, I added a bag of frozen cauliflower in with it to roast. The cauliflower soaks up the juices while roasting and makes this a fabulous one pot meal. Thanks so much for this recipe! Been searching hi and low for a way to cook chicken legs and this knocked it out of the park! Can’t wait to check out the rest of your recipes! i love this recipe! it was easy and quick and made my house smell incredible. it needed almost 30 more minutes in my oven than recommended but stayed moist. I would just suggest everyone check the temp of their chicken before taking it out. This was just perfect. I didn’t change a thing. Thank you! Living as an expat in Scotland, I love finding good recipes from the US that I can make here. I’ve made this one a couple of times and it’s a huge hit! I usually have a bunch of people over, all from different countries, for a “home cooked” meal. This one is the best! It’s delicious, easy, and cheap for feeding a group. I’ve learned to make sure to have lots of bread for dipping into the juices and adding an extra orange sliced because guests will fight over those delicious pieces. Thanks for the recipe! I found this on Pinterest and made it tonight. I didn’t use the herbs as called for in the recipe. Instead of Italian seasoning, I used a dried Herbes de Provence. And, for the herbs on top of the chicken, I used chopped, fresh rosemary, and that’s it. I used a bigger roasting pan and threw in some red potatoes to roast with the chicken. Served with a salad. Everyone loved it!! I have a family with six children (youngest is a nursing baby, so she didn’t have an opinion), so you know a recipe is a keeper when everyone loves it! Oh! I also started with a whole, organic chicken, and even with cutting it up, the prep only took me 45 minutes. I forgot: I started this using the convection option on my oven. I would not suggest that, because it started browning the citrus rinds much too early, and the chicken skin didn’t brown as evenly, either. After about 15 minutes, I changed it to normal bake, at 400 degrees. After 3 days of being sick all I wanted to do was make this recipe. Seriously, lol. The pictures had me drooling. Tonight I got the energy to cook and made this for my love to thank him for the amazing job he’s done taking care of me. Can I just say ohhh my goodness this recipe was SO good! Hubby loved it too which means it’s a definite keeper. :) We also tried the Crock Pot Honey Sesame Chicken a few weeks ago…loved that one too! Thank you for these awesome recipes and drool worthy pictures to go with them! We tried this tonight and it was SO GOOD! I used boneless skinless chicken thighs and then normal drumsticks. The juice was amazing and we were glad to have mashed potatoes to eat it with :) A salad finished off our dinner, and even my picky kids ate the chicken! (2 and 4 years old, so it’s a win if I can get them to eat anything!). Thanks for the recipe! This is DELICIOUS! Thank you so much for the recipe! I served it with a pasta salad using apple cider vinegar, honey, and olive oil. Yum!! Do you leave skin on the chicken? Can I omit the Italian seasoning? Will it make a big difference? Yes, leave the skin on. I wouldn’t omit the Italian seasoning – Just replace it with any other favorite seasoning, or substitute with a mix of basil/thyme/rosemary. I realized I don’t have fresh garlic, do you think garlic powder can work instead? thanks! Sure! I’d add 1/4-1/2 teaspoon garlic powder, depending on your preference. This was fabulous!!!! I will be making this again and again! Omg, found your recipe on Pinterest. I needed a quick dish to make and this was it. Can’t wait to see how much the family loves it. By the way the house smells divine! Thanks so much! What a simple yet elegant dish! I found this on Pintrest and decided to make it even though it looked like it would be complicated/ expensive. Boy was I wrong!! It took no time to throw together and I had everything on hand already. I am serving it again tonight (it is currently in the oven and the whole house smells great!) for the 3rd time in a month. My husband can’t get enough and asked to me to make enough for him to take to work to share with his co worker. Even my daughter enjoys it and she hates chicken on the bone. So thank you for a great recipe and I will be looking around your site for more! If I’m only cooking for 2 and probably only 5 or 6 pieces of chicken should I still cook it at 400 degrees and for 40 minutes? Sorry I’m not really good in the kitchen. Yes, cooking temp and time will be the same. I was looking for a chicken pieces recipe to make for a dinner for 30 and came across this. Sounds simple and easy and after reading some of the reviews, this is what they are getting. I’m going to serve it with roasted sweet and white potatoes and fresh asparagus. Thanks for the inspiration. Will let you know how the group liked it. oh… I guess I should also say that I’ve been using boneless, skinless breasts. It is still an extremely tasty recipe even without the skin and the darker meat! Wow. I’ve fallen in love with this wonderful recipe. Hello! I absolutely adore this chicken and will ba making it for a my hubby’s huge family. I was looking to do two pans of the chicken pieces and one pan of just drumsticks. Since I have never done just drummies in a pan, I was wondering if the time or temp would change? Thanks so much! No need to change the cooking time or temp if you’re just using chicken drumsticks. Used boneless skinless chicken breasts because that’s what I had on hand, but, otherwise, made no modifications. Absolutely delicious, easy, and very visually appealing! Just fabulous all around. Hi can I use boneless skinless chicken breast? One more question! Should I flip the chicken so it cooks evenly? No need to flip it, just cook according to the directions. Made this using chicken beast for my meal prep and omg! I loooove it. So delish, looked forward to having it as my dinner every night. Only one question, is there a post for the nutritional facts? I like to log my meals on MyFitnessPal. thanks!! This looks awesome! I am thinking of making this for a care meal for a family friend. How would this reheat and what would be your reheat instructions? I appreciated your help! For reheating, I’d recommend covering the chicken with foil and warming at 300 degrees F for 20-25 minutes. I made this Saturday night for friends and it was fantastic! Superfast and easy prep with stuff you probably have in the house. My guests loved it. I served it with roasted veggies with some gorgonzola sprinkled on top (after they come out of oven). It worked out perfectly since the chicken cooks at a higher heat that is compatible with roasting veggies. Also, I happened to put out a loaf of french bread which we all used to sop up the fantastic sauce. Wonderful! Thank you so much! How do you think this would work with fish? Hi Sarah – It depends what kind of fish you use, but I’d choose a white, firm-fleshed fish such as cod or halibut. You’ll want to decrease the cooking time and temp, too. This was a WONDERFUL dinner! Looked beautiful before going in the oven and looked even more beautiful coming out! The smell throughout the house was amazing. Thank you. Only wish you had a Star Rating System, cuz it would get Top Dog! It was so great, so easy and so inexpensive. Definitely a new keeper. Thank you. This is an excellent dish! I make it every time we have guests for dinner. Easy and delicious! I love making this meal. I probably make it for my family too often but it’s just so delicious! Hi, Georgia! This recipe sounds and looks delicious. Great job! I am making it this weekend for a crowd of about 70 people and I look forward to it. I’ll be serving it with creamy potatoes au gratin and fresh steamed broccoli. I was wondering, what do you think of me substituting the olive oil and herbs (for cooking not garnish) with Italian salad dressing/marinade? I understand that I may have to add a little more olive oil and possibly even scale back on the salt. Thanks for your kind comment, Teaa. I think Italian dressing would work fine, though I’ve only ever made the recipe as written so can’t vouch for the taste/quality if using ingredients other than listed. I’d roast a test batch before serving such a big crowd. Good luck! Thanks so much for sharing. This dish was seriously so good! I hope you don’t mind, I shared it on my blog as well! This is a phenomenal chicken recipe!! It tasted sooooo good, love the Orange and herbs combination. I use chicken breast, didn’t have the time to marinade and it was crazy good. Thanks! I just cooked this last night for today’s lunch at work…thank you for this recipe! I just got tired of lemon pepper or grilled chicken, I cooked for side dish galic lemon potatoes and brussels sprouts! cant wait to eat!!! Made this last night and it was a big hit! Mois and delicious. I was concerned it would be too citrusy and sweet but it wasn’t at all. As another post cited, the sugar balances out the acidity of the lemons and oranges. I paired with baked potatoes but will try with orizo next time. I am cooking this for casual christmas dinner with friends tomorrow! If I want to double the meat, should I double the rest of the ingredients? Any suggestions? Yes, I would probably double the rest of the ingredients. Hope you enjoy! This recipe looks amazing! I just squeezed a bunch of oranges so I’m not sure how much orange juice is one orange. Would you be able to give me a estimate measurement? Sorry might be a silly request but thanks! Thanks, Bridgette! Not a silly question at all – one orange juiced would be 1/4 cup juice, more or less, depending on the orange’s size. Enjoy! Hi, Georgia sorry to trouble you but I need your expertise. I am having a large group of people come over next week and I would love to make this chicken dish. I currently have a whole chicken which the butcher cut into 4/6 large pieces I will cut it further to make more pieces . I believe I will need more than this so I will buy thighs and drumsticks. Can I put them in the oven in two separate trays and if so what will the cooking time be?also if I do not use thyme and rosemary but instead opt for cilantro how much cilantro will I need? Finally can I marinate it in the same tray and directly put in oven?thank you in advance! The cooking time would remain the same for a larger amount of thighs and drumsticks. However, if you’re unsure, the temperature of the fully cooked chicken should read 165 degrees F. If you’re using dried cilantro, just swap the same amount of dried herbs for the dried cilantro. If using fresh, do not cook it with the chicken, add it as a garnish at the end. Yes, you can marinate in the tray and then add it to the oven. Hope that helps! Thank you very much ! Happy Holidays! We are making this for a dinner party tomorrow. Using all drumsticks. I’m concerned that the skin of the chicken that is face down or immersed in the liquid will not brown or cook properly (likely be boiled). Has anyone had this problem? Any sugesstions? Perhaps turn the chicken throughout cooking process or broil the chicken at the end? Thanks for all suggestions. Hi Dan – If you’re concerned, you can turn the chicken throughout cooking, but I’ve cooked this chicken dozens of times and never had the problem you’re referring to. It will still turn out crispy and delicious! I’m making this right now! I am marinating in the ingredients ahead of time then it will be so easy to toss it all in the pan and bake! Wowza! I made this on Saturday night. It was AMAZING! I doubled the garlic, sprinkled on some garlic powder and threw in some saffron threads and a little extra olive oil (I love well-seasoned food). I had a good amount of juice left under the chicken which I poured on top of some lemon/garlic basmati rice. The two paired wonderfully. Everyone loved it. I marinated the chicken for at least 3 hours. Next time, I may leave it overnight for added lemony flavor. Thanks for posting this Georgia! I’ve made this three times now with both skin-on/ bone-in chicken parts and boneless skinless breasts. No matter what I do it turns out beautifully! The jus is my favorite part! 1) (from my MIL) can we add mushrooms and carrots into this? If yes, then when should we add it into the roasting pan? Beginning or after a bit? 2) Can I add cherry tomatoes into this like your other recipe Lemon, tomato and potato baked chicken? I’m so excited about this recipe because I’ve had horrible food aversions since the start of my pregnancy (besides horrible morning sickness) and is just getting over it…slowly. I LOVE chicken (especially thighs and drumsticks) but of course chicken was mainly what I had aversions to (so sad) But finally the last few days I’ve been able to eat some chicken again and starting to crave for it!! So happy!! Thanks in advance again for your help!! Hi Frankie – Thanks for your kind words! And trust me, I completely understand the chicken aversion in pregnancy. I couldn’t stand it! So, for mushrooms, carrots and tomatoes, I would add them during the last 30 minutes of roasting, since they’d likely overcook/burn if roasted for the whole hour. Hope you love this recipe and report back your results! OMGoodness this chicken recipe was FABULOUS!! Everyone really liked it! I loved it so much!! And baby in my tummy (yes…I’m carrying #) was so happy too!! My oldest son loved it so much he kept saying during dinner “thank you mommy for making this for me! Can you make it again?” he ate so much!! We ended up not putting any mushrooms or carrots into the roasting pan (got side tracked and forgot) and we didn’t miss it at all. In fact I don’t think mushrooms would have gone well with this sauce. Served it with baked potato and rice…cause we’re Chinese so had to have rice. Some ate the chicken with rice some ate with baked potato. I was able to marinate the chicken for about 4 hours. Next time I will try marinating overnight. The sauce was wonderfully light and citrusy-wonderful! The chicken was cooked to perfection. So juicy and not over cooked! And the skin was so beautifully browned (and was the best part! LOL!) Next time I want to try serving this chicken with orzo. I’ll just cook the orzo plain then mix it with the sauce from the roasting pan. Sounds so yummy!! So BIG THANK YOU FOR THIS WONDERFUL RECIPE!! Can’t wait to try your other wonderful creations!! Thanks so much for your positive review, Frankie! I’m SO glad you and your family enjoyed this recipe! The cook time on this seems very long. My chicken parts (leg quarters) reached 165 in about 25 minutes. Why the one hour cook time? You might want to get an oven thermometer to test the heat of your oven – it sounds to me like it’s running too hot. I’ve made this recipe dozens of times at the same temperature, and it’s always yielded perfectly juicy chicken. Sorry if this is a dumb question but if I went to marinade overnight, is there a recommended amount of hours/maximum before it’s been marinating TOO long? I would say up to 2 days is the maximum time you should marinate refrigerated, otherwise the chicken may soak up too much of the mixture and start to spoil. I just came across your website on Pinterest and made this chicken. My family and I loved it. Thank you! I am making this tonight, but I don’t have onion powder – any suggestions for a substitute? You can omit the onion powder or substitute with 1/2 tsp. dried onion flakes. I wouldn’t recommend it, as the chicken would likely dry out. You can bake the dish and store refrigerated up to 1 day in advance, however. Can I use a roasting pan? If you’re asking about a roasting pan with a wire rack, it’s not necessary. Just use a large casserole dish. Every week I make at least one new recipe i find on a blog, usually through Pinterest… But i rarely fall in love with something so much I have to comment BUT HERE I AM! This was the most delicious chicken dish I’ve had in quite some time! When I pinned it I was like hm could be good, then as I was preparing it I was like I think this might be an amazing dinner… I was right. The citrus blended with the sweet (I used honey ) was to die for… I used fresh rosemary and of course plenty of garlic so this dish was a 10. I highly recommend it. This looks so delicous!! I’m hosting a dinner for 10 people (5 couples) do you think doubling the recipe would be ok? I have a standard sized oven – it should all fit right? If I used a disposable foil tray for roasting, will it still bake the same? Thanks for the recipe! Yes, this recipe would double just fine. I would use two 13 x 9-inch roasting pans, same time and temp. For dinner parties, I always serve it with my Parmesan Vegetable Tian and No Knead Artisan Crusty Bread. Hope you enjoy! This was so flavorful!!! Will be making this again! i was wondering could I make this in the crockpot instead of the oven? This looks amazing, so excited to try it… what do you think of using a roaster instead of the oven? I have only ever cooked this dish in the oven, so I can only attest to its success with that cooking method. You could certainly try it, though! Hello there, I’m going to make the marinade, however, I’m fresh out of oranges. I do have grapefruit juice and lemons….. thoughts? Go for it! I think grapefruit juice would be a delicious substitution. Hope to make this tonight; how would I adjust the cook time to do a mix of breasts and legs? Please reference the Notes section of the recipe for chicken substitutions and different cooking times. Hi, I was wondering what italian seasoning is. is that the jar of herbs or is this the package of Italian dressing to mix with liquids? I found your great recipe and am cooking a church dinner for about 50 people. I noticed you mentioned using multiple 13×9 pans…would you happen to know if this would come out just as well using large roaster pans in the ovens? This dish only requires one 13 x 9-inch pan. Italian seasoning refers to the dried herbs. I’m probably late to the game, but a comment is a comment. This is baking in the oven now and several minutes into the baking time, the house is smelling DEEEElicious! I stuck to the recipe and using the extra oven space to make roasted brussel sprouts and potatoes. Is there a Pinterest link? I’ve looked all over, but can’t find it. Looks so good! Every image should have a “pin it” button on the top left corner when you hover. Is that what you’re looking for? Let me know if you’re still having trouble! I saw shorter time for chicken breast, is that for boneless? If bone in should I cook for same amount of time as the thighs and legs? Thanks for your help. Cooking bone-in chicken breast for 40-50 minutes would most likely be best. Do you think adding some potatoes and carrots to cook with the chicken would work with this recipe? Usually when I cook a chicken I try to include veggies so that its a one dish meal. But not knowing the flavors and how it cooks wasn’t sure it if would work with this recipe. I have made this twice now (in the oven for a third time) I’m in love. It’s so simple but presents its self with a bit of rustic elegance. The first two times I followed it to a tee (I’d always recommend marinating over night or a full day, so much more flavor). I’ve had leftovers that I’ve shredded up and froze, then used in a simple chicken noodle soup, wow bold flavor! Currently I have it with cilantro, limes (they’ve been really cheap lately) some spicy seasoning and some smokey seasoning. Going to pair it with rice and an avocado salad for dinner and then make some rice bowls for lunch this week. Easy, delicious, crowd-pleaser. My guests kept commenting on how good the house smelled as it was cooking. Simple enough for a week-night dinner, yet beautiful enough for a special occasion/large group meal. I’ve cooked a similar dish like this one. I thinly sliced potatoes and put them underneath the chicken. the potatoes soaked up the juices and made a great meal excellent! This is a delicious chicken dish. I served it with garbanzo bean rice and Greek salad. Delicious! Quick question……what have some of you done with the juice/broth from the chicken. its so yummy I’d like to serve it on the side somehow. Excelent Very good ! Site directed to health and well-being – Quality of life. I’m only just now about to try this recipe, but my guess is that you could thicken it with a little corn starch (or, corn starch + cold water shaken up etc.) in a sauce pan to make a glaze/sauce for the starch or veggie of your choice, but I’m not sure how much to use per liquid – probably the general rule of “a little at a time” if that isn’t something you’d find frustrating. I would eat in absurd amounts that dish! These amazing photos make me want to eat everything! Você poderia postar alguma receita que use cerveja no molho?